Our iconic family holiday park is the perfect place for your well-deserved holiday. 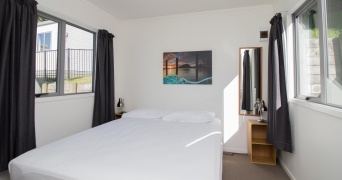 Experience our variety of accommodation options located both on the famous Mount Maunganui Main Beach and on the shore of the Tauranga harbour. 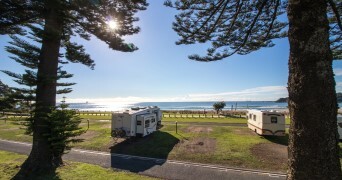 We offer a range of mid-priced beachfront accommodation options including camping, campervan and caravan sites, on-site caravans and cabins. Sit back and relax after a day filled with fun activities. 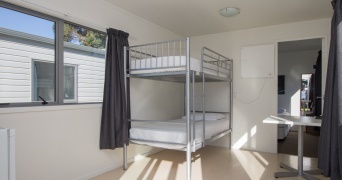 Our spacious family cabins are the perfect spot to relax and watch the world go by while on holiday. Sit back with your loved one and watch the sunrise over the ocean from your own deck. Bring family and friends for a retro holiday experience with an ocean view like no other. 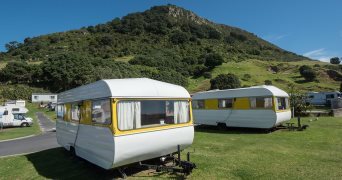 Park up your caravan on our spacious sites with plenty of room for camping gear, bikes and more.